Bolliger, D.U. (2004). Key Factors for Determining Student Satisfaction in Online Courses. International Journal on E-Learning, 3 (1), 61-67. Norfolk, VA: Association for the Advancement of Computing in Education (AACE). Retrieved April 20, 2019 from https://www.learntechlib.org/primary/p/2226/. Aggarwal, A. (Ed.) (2000). Web-based learning and teaching technologies: Opportunities and challenges. Hershey, PA: Idea Publishing Group. Astin, A.W. (1993). What matters in college? Four critical years revisited. San Francisco, CA: Jossey-Bass. Bean, J.P., & Bradley, R.K. (1986). Untangling the satisfactionperformance relationship form college students. Journal of Higher Education, 57, 393-412. Belanger, F., & Jordan, D.H. (2000). Evaluation and implementation of distance learning: Technologies, tools and techniques. Hershey, PA: Idea Publishing Group. Biner, P.M. (1993). The development of an instrument to measure student attitudes toward televised courses. The American Journal of Distance Education, 7(1), 62-73. Biner, P.M., Dean, R.S., & Mellinger, A.E. (1994). Factors underlying distance learner satisfaction with televised college-level courses. The American Journal of Distance Education, 8(1), 60-71. Bonk, C.J., & Cunningham, D.J. (1998). Searching for learnercentered, constructivist, and sociocultural components of collaborative educational learning tools. In C.J. Bonk & K.S. King (Eds. ), Electronic collaborators: Learner-centered technologies for literacy, apprenticeship, and discourse (pp. 25-50). Mahwah, NJ: Lawrence Erlbaum. Bower, B.L., & Kamata, A. (2000). Factors influencing student satisfaction with online courses. Academic Exchange Quarterly, 4(3), 52-56. Chong, S. M. (1998). Models of asynchronous computer conferencing for collaborative learning in large college classes. In C. J.
Donahue, T.L., & Wong, E.H. (1997). Achievement motivation and college satisfaction in traditional and nontraditional students. Education, 118, 237-243. Retrieved August 28, 2001, from: InfoTrac database (Item A20479498). Edwards, J.E., & Waters, L.K. (1982). Involvement, ability, performance, and satisfaction as predictors of college attrition. Educational and Psychological Measurement, 42, 1149-1152. Feenberg, A.
Finaly-Neumann, E. (1994). Course work characteristics and students’ satisfaction with instructions. Journal of Instructional Psychology, 21(2), 14-19. Harrison, N. (1999). How to design self-directed and distance learning. Boston: McGraw-Hill. Hiltz, S.R. (1993). Correlates of learning in a virtual classroom. International Journal of Man-Machine Studies, 39, 71-98. Hobbs, V.M., & Christianson, J.S. (1997). Virtual classrooms. Educational opportunity through two-way interactive television. Basel: Technomic Publishing. Keegan, D. (1990). Foundations of distance education (2nd ed.). New York: Routledge. Maki, R.H., Maki, W.S., Patterson, M., & Whittaker, P.D. (2000). Evaluation of a web-based introductory psychology course: I. Learning and satisfaction in online versus lecture course. Behavior Research Methods, Instruments, & Computers, 32, 230-239. Mood, T.A. (1995). Distance education: An annotated bibliography. Englewood, CO: Libraries Unlimited. Moore, M.G., & Kearsley, G. (1996). Distance education: A systems view. Belmont, CA: Wadsworth Publishing. National Center for Education Statistics (NCES). (1999). Distance education at postsecondary education institutions: 1997-98 (NCES Publication No. 2000-013). Washington, DC: U.S. Government Printing Office. Navarro, P. (2000). The promise-and potential pitfalls-of cyberlearning. In R. A. Cole (Ed. ), Issues in web-based pedagogy (pp. 281-297). Westport, CT: Greenwood Press. Navarro, P., & Shoemaker, J. (2000). Performance and perceptions of distance learners in cyberspace. The American Journal of Distance Education, 14(2), 15-35. Palloff, R.M., & Pratt, K. (1999). Building learning communities in cyberspace: Effect ive strateg ies for the c lassroom. San Francisco: Jossey-Bass. Richards, C.N., & Ridley, D.R. (1997). 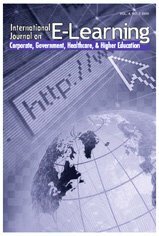 Factors affecting college students’ persistence in on-line computer-managed instruction. College Student Journal, 31, 490-495. Smith, P.L., & Dillon, C.L. (1999). Comparing distance learning and classroom learning: Conceptual considerations. The American Journal of Distance Education, 13(2), 6-23. Wetzel, C.D., Radtke, P.H., & Stern, H.W. (1994). Instructional effectiveness of video media. Mahwah, New Jersey: Lawrence Erlbaum. Williams, W.M., & Ceci, S.J. (1997). "How’m I doing?" Problems with student ratings of instructors and courses. Change, 29, 12-23. Is blended e-learning as measured by an achievement test and self-assessment better than traditional classroom learning for vocational high school students?